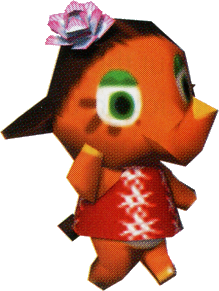 Elina is a snooty, elephant, appearing in Animal Crossing as an islander. Her Japanese name, Bindi, comes from the red mark on her forehead, which is worn by many South Asian women, especially Hindus and, for whom elephants are of great religious importance, and Jains. Additionally, her Japanese catchphrase, Namaste, is a greeting used by Hindus. Elina is an orange elephant who wears a Red Aloha Shirt and has a purple flower in her hair. She has dark brown hair on her head and the tip of her tail. She has green eyes and wears green eye shadow. The tip of her trunk and hooves are light orange. She also has a red stone or circle on her forehead, known as a bindi, which is worn by many South Asian women, especially Hindus, for whom elephants are of great religious importance. Elina also has a half-smiling mouth with red lipstick on the left side of her face, like many other elephants. Elina has a snooty personality, which means she will appear arrogant and snobbish towards the player, but will appear friendly and nice in some conversations. She finds appearance important. Her attitude towards the player changes, as she begins to warm up to them, but she will still retain some arrogance and subtle rudeness. As an islander, Elina has a favorite fruit and a fruit that she is allergic to. Feeding her the latter will reduce the likelihood of her dropping money bags. In her case, Elina is allergic to apples and loves pears. Initially, Elina's house lacks any furniture. She will request a Birdcage, Blue Vase, Exotic Bed, Exotic Chair, Exotic Screen, Exotic Wardrobe, Glass-Top Table, and a Turntable from the player, using the furniture to decorate her home. It's hard to tell if Elina is trying to be motherly, grandmotherly, or just bossy and big-sistery, but there's one thing for sure - she's not afraid to tell you where you've gone wrong. Modified on March 4, 2019, at 19:45.